When you’re out to buy a new car, everyone wants a good deal, but the process can seem intimidating. However, with a little homework up front, anyone can be a successful negotiator. Here are a few things you can do to make sure you pay the lowest amount possible. To come up with the opening offer you need to know what the manufacturer’s suggested retail price (MSRP) and the actual cost that the dealership paid. A good place to find the dealer’s invoice price is to go Edmunds.com. You can select your model and all the optional packages and features that you want and find both the invoice price and the MSRP. If the dealer tells you your invoice price is wrong, quote the MSRP to let him or her know that your numbers come from a reliable source. Assure the salesman or woman that you intend to make sure they make a profit. If you’re a Lexington Law® client Premier Plus client, you will receive your FICO® credit score as part of the credit repair process. If you’re not a Lexington Law client, you can also get a feel for your credit score by getting your VantageScore at a free scoring site like Credit.com. Once you know what your score is, you can do some homework online and find out what rates are there for your credit range. If you have less than stellar credit, you may be adding hundreds of dollars to the price of your car over the life of your loan because of the higher interest rates for which you will qualify. It’s important to know where you stand. Credit scores range from 350 – 850. Good credit is defined as 640 – 740; excellent credit is defined as anything above a 740 credit score. If you have anything less than good credit, you will need a special loan product and you will be paying more for it. One of the ways a dealer makes money on a car deal is the financing. Lenders receive a commission for originating a loan with an auto finance company, and the higher the interest rate, the more commission they will receive. It pays to do your homework before setting foot on the dealership lot and know what current auto loan rates are. A smart move for auto financing if your credit is not up to snuff is to go to a credit union. Credit unions often have good deals for people with credit scores that are good but not excellent, and the fees are usually competitive. If you have outside financing, you’re cutting the profit margin for the dealer upfront and you are then paying less money for your car. Of course, it pays to listen to what the dealer has to offer, they may be able to beat the financing terms you have brought with you. Besides financing and profits on the price of the car, your trade in is the other profit center for the dealer. A dealer may tell you you are getting a lot of money for your trade in, but as part of the deal, they may increase the sales price of the car or charge you a higher interest rate to make up the difference in lost profit. If you want to know your trade in value, go to Kelly Blue Book’s website and plug in the numbers to know the value of the car. Make sure you are getting the full price of your trade-in in the deal. It’s easy to lose track of how much your automobile is actually costing you over the life of the car if you only look at the payments. The dealer will try and keep your attention on the payment, as it is simple to roll in costs into the loan. It’s easy to say yes to add-ons when the payment only goes up a few dollars a month, never mind that those few dollars a month can really add up over a 6 year loan period. 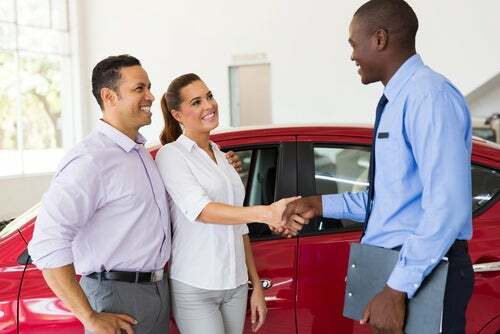 Get a list of all the costs of the deal, your car price, the total interest over the life of the loan and any add-ons like extended warranty programs. Make the deal based on the total costs, not on the payment. This entry was posted in Loans and tagged Credit Score. Bookmark the permalink.